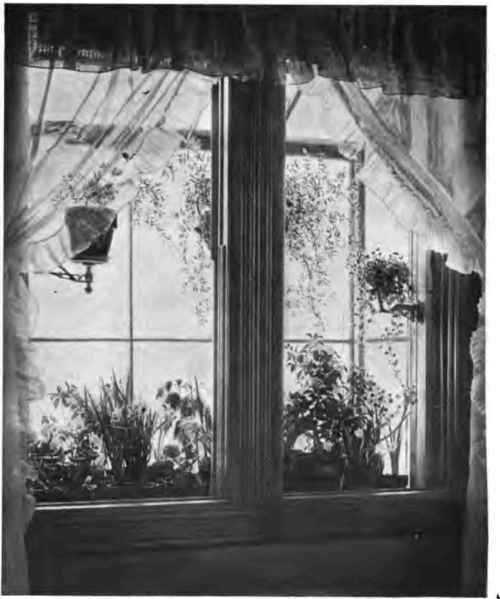 This section is from the book "How To Make A Flower Garden", by Wilhelm Miller. Also available from Amazon: The Well-Tended Perennial Garden: Planting and Pruning Techniques. 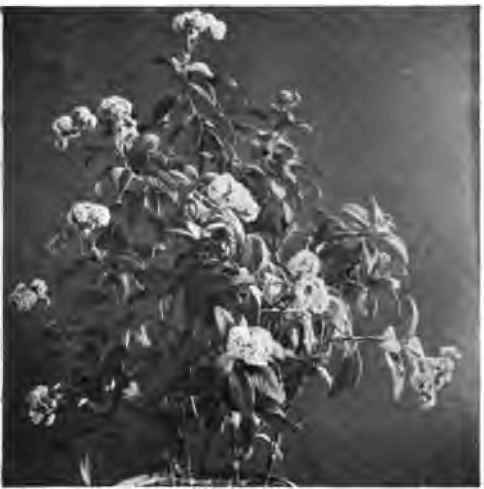 "The pictures which I send you show the entire plants (without any frills or fake), which were raised in this particular window by two 'simon-pure' amateurs, in a cheaply constructed house, alleged to be warmed by a gas-belching furnace during an erratic winter and a phenomenal February, with a further plant-handicap of a new-born babe, which was not only first in our thoughts, but required a high temperature to be maintained by night as well as by day. Our window garden is a two-by-four affair, composed of a couple of greenhouse sash which I screw on in the fall and take off in the spring, and you could buy the whole thing, bulbs and all, I presume, for five dollars." There are two adjoining windows on the south side of our house giving on to a small balcony. In October we remove the sash from these windows and screw up the window garden. It is really a bulk window with a glass roof; the roof is on hinges, and can be raised to admit of ventilation. The floor of this window is half a foot below the level of the window-sills. A second floor resting on brackets is flush with the sills. This makes an airspace tinder the pots, which keeps out much of the cold. The balcony also gives good protection, else we should have to take greater precautions against sudden changes in temperature. The only heat the garden receives is from the room. We have had no trouble with the cold, however, but rather the reverse, and have to hang a sheet on the outside of the window to subdue the intensity of the sun. In the window we have a floor space four feet long by one and a half feet wide. 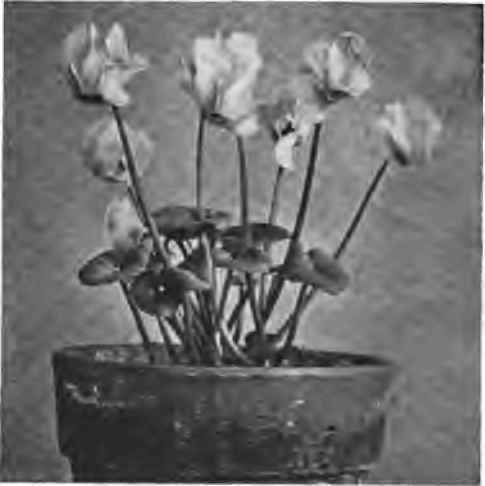 In this we have raised and brought into bloom eighteen pots of bulbs and half a dozen pots of various kinds of flowers. A good corner of bulbs - hyacinths, tulips, narcissus. Last September we took up such plants from the garden as we wished to bring into the house - heliotrope, begonias, abutilon, ageratum, coleus, and geraniums. 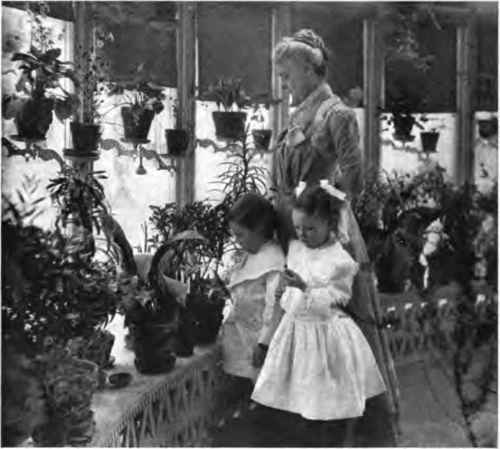 The three former were potted and cut way back; the latter were slips. These gave us some flowers while the bulbs were being started. 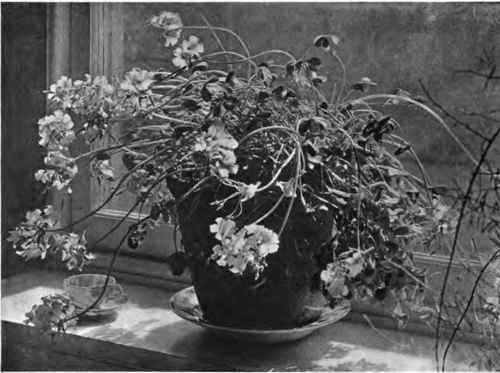 As the bulbs came into the window we relegated the ageratum, coleus, and geraniums to other parts of the house where we have flower-shelves in the windows. We found, also, that the garden was too warm and sunny for begonias and a little Primula obconica, so they went into a northeast window, where they did wonderfully well. The window garden as seen from the inside. We planted the bulbs in October, and tried to follow the many directions we had read of. "Keep them dark," and "Keep them cool," and "Keep them wet," and "Keep them dry," and "Keep them in the cellar," and "Keep them in the attic," and "Sink the pots in the garden," and "Bury them in moss or sawdust in the cellar," etc. 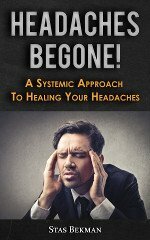 ; but unforeseen demands on our time made it necessary for them to take care of themselves. They had one good thorough watering when planted, and were placed on a dark swinging shelf in the cellar. 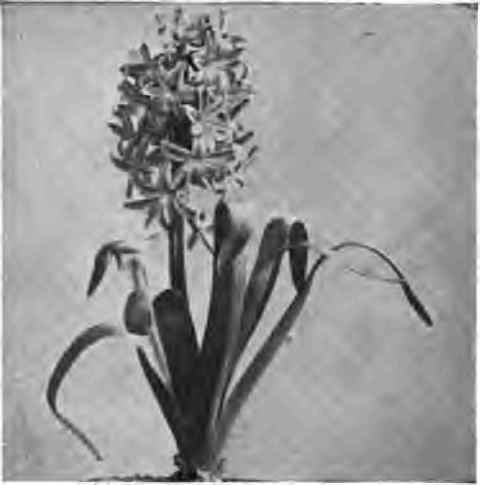 A month later we found them bone dry and no sign of top-growth except one Paper White narcissus. 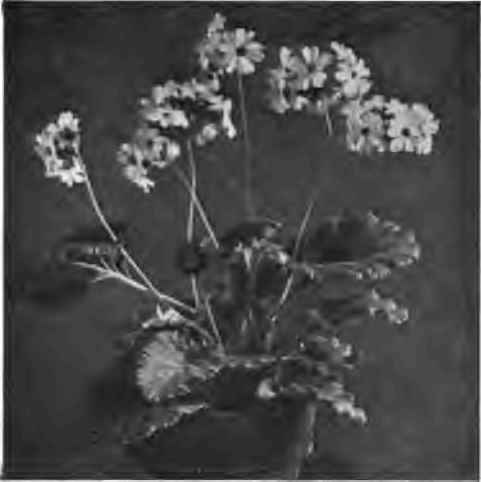 One of the primroses - Primula obconica. The Bermuda buttercup (oxalis lutea) - an ideal window plant. Root-growth had apparently done very well, so, after watering, the entire lot were transferred to the attic, where they had subdued light. We kept them moist, and they began to grow in a very good succession. The Paper White narcissi were the first to appear, and we put them for a week or so in a west window before bringing them into the strong sunlight of the window garden. As each kind came along we treated it in the same way, and we had flowering bulbs from December 10th to the middle of May. Our Spanish iris failed to bloom, though we had a splendid crop of foliage (which looked like garlic). 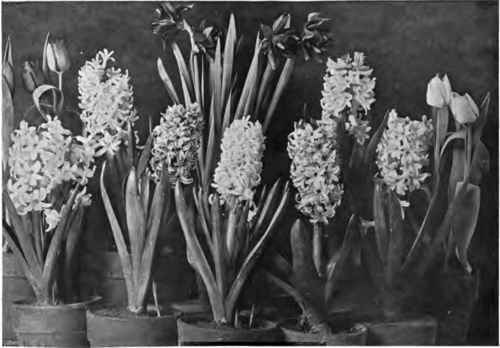 The following is our stock of bulbs: Twelve single Roman hyacinths (pink, blue, yellow, and white), two Scilia Cubana, six freesias, three Narcissus gloriosus, three Narcissus Horsfieldii, four Narcissus Emperor, six Narcissus poeticus ornatus, six Spanish iris, six Paper White narcissi, six Giant White narcissi, six grape hyacinths, and four cyclamens. 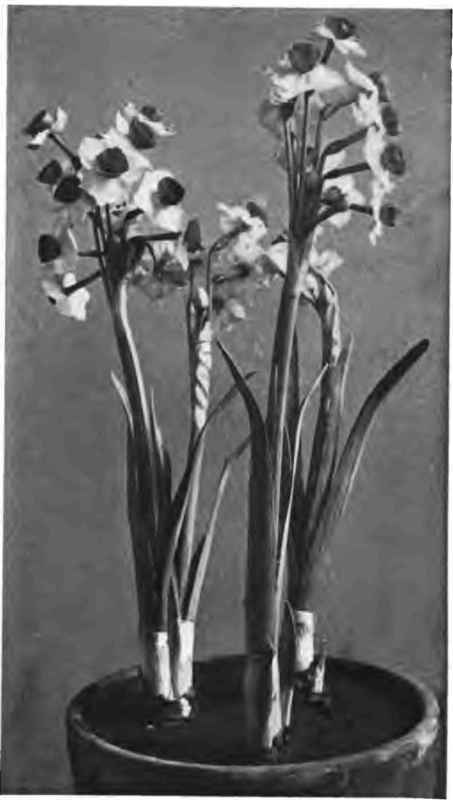 The polyanthus narcissus - Narcissus Tazetta.